Let's face it, being a millennial girlboss is the toughest, most rewarding, and might I add awe worthy positions to have in this lifetime. I'm not just saying that because I'm a millennial, but because of the amazing millennial women I know and the amazing things they do. As a millennial we have one foot in the older generation and one foot in the younger generation. This makes for a unique and talented group of women. We're the perfect mix of tradition and creativity. Our unique set of talents provide us many opportunities, but also many challenges. Today I'm showing you how to be not just a millennial, but a millennial girlboss. 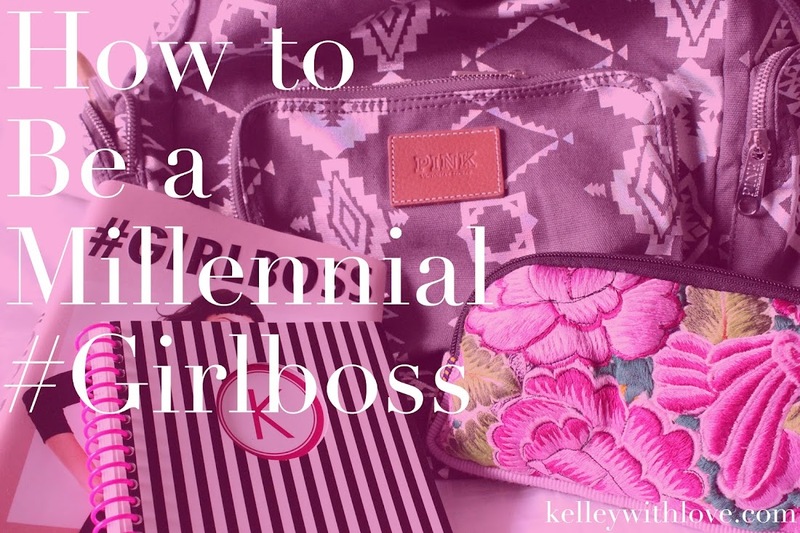 Check it out below and share with all of the millennial girl bosses in your life! Like most things, tradition has its place and that may or may not be in your life. I think tradition can be a really amazing way to pay tribute to those that came before us. It only becomes a problem when it takes the place of our happiness. This is your life and you deserve to live it doing what makes you truly happy. Sometimes we feel forced to do things because it's expected of us or because we don't think we have other options. The truth is you have all the options in the world plus the trillions you could create. Let go of the pressure to do what is "expected" of you and create your own path! The millennial #girlboss that chooses to create her own path must be ready at all times to make a mistake. We often fall into routine and tradition out of fear of making a mistake. It's okay to make mistakes. In fact, you will make mistakes regardless so you might as well make them doing what you love. Never let fear keep you from doing what you love and never let a mistake hold you back. Own your mistakes and learn from them. It's safe to assume that you will have people that will support you and others who will not. You have to be prepared to meet resistance once you set out on a path of your own. Sometimes that resistance will come from those you love the most. It's okay if they don't understand because why youve chosen to do what you do at first. This is your journey and it is about you. If you don't take care of yourself you won't be able to take care of anyone else - and that includes putting your happiness first. With all this talk in the world about choosing your own path and doing what you love, it's easy to loose yourself. In the moments when you don't know where to turn or what to do try something new. Trying new things help us to conquer fears, learn new skills, explore new paths, and create new opportunities. A millennial girl boss never stops learning and has tons of tools up her sleeves. Be grateful. Give love. Make someone laugh. Send snail mail. Give back to your community. There are tons of ways to do good in the world. Even though it's important to live your life for you, its also important to do good for others. Living the life of your dreams is a good way to start putting good into the world. This alone is an act that can truly inspire others. Remember to do what you love, do good, and leave every place and person better than they were before coming in contact with you. What makes you a millennial #girlboss? I absolutely loved reading this post #BLMGirl. In my opinion, I'm a millennial #girlboss because I never give up. Love this post, Kelley! I will practice being more of a millennial girlboss by trying new things and making my own path! Thanks for sharing these tips.